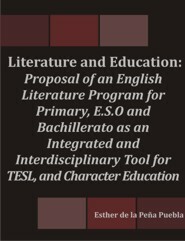 This work seeks to analyze the role that literature has played within the educational sphere throughout the past and recent years, the conflicts derived from the academic views, and how literature is an essential tool for the comprehensive study of a second language, as an integral part of the educational process. The principal aim of the model suggested in this thesis is the introduction of non-traditional approaches to the integration of literary texts, as a cross-curricular interdisciplinary resource for the learning of English as a second language. The literature program here proposed enhances the figure of the teacher and promotes the skills, knowledge, and competences of the students within a multicultural, changing society. Esther de la Peña Puebla was educated at the University of Seville, graduating in English Philology in 1991. During her years of study and work in the USA, she actively pursued her interest in literature as an interdisciplinary tool in Second Language Acquisition. Back in Spain, she spent several years teaching English and Literature at different schools and academic institutions. In 2010, she returned to the University of Seville to obtain her Master's Degree in English Studies. In January 2013, she completed her doctoral dissertation.